Inducted 1993. Won 166 Games, One State Title as Soccer Coach. Coach AI Knepler has just completed his 21st year as a head soccer coach. His career started at St. Joseph Seminary where he stayed 3 years, compiling a record of 31-21-3. He then returned to his alma mater, QND, where he spent 10 years compiling a record of 166-53-16. He moved to Quincy High School for one year with a record of 14-4-2. In his 7 years at Glenbrook North High, his teams compiled a record of 101-51-23. His overall record is 312-129-44. This year he became the first coach in Illinois history to win 100 games or more at more than one school. Over 21 years AI has taken 6 teams to the state tournament. His 1985 QND team won the state championship, and his 1984 QND and 1989 GBN teams were state runners up. His teams have also been noted for their clean play and fine sportsmanship. His 1981 and 1985 QND teams were recipients of the Myro Rys Sportsmanship Cup. 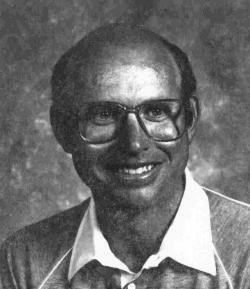 Knepler was the recipient of the Illinois High School Soccer Coaches Association “Coach of the Year” award in 1985. Knepler has been very active and involved in not only coaching soccer, but has served on several committees involving soccer. He served on the IHSA Soccer Advisory Committee in 1982, 1983, and 1984; Coordinator for Region 7 IHSSCA for four years; and served on the National Federation Soccer Rules Committee for one year. Besides his involvement in soccer, Knepler has been involved in his community. He served on the Quincy Mayor’s Advisory committee for 4 years and the Education Advisory Committee for Quincy University from 1981-1984. He has been recognized as an outstanding Young Man of America in 1980; received the Physical Education Alumni Award from Quincy University in 1981; and in 1985 was honored as one of five Outstanding Class A Athletic Directors in Illinois. The last 7 years he has been involved with the Northbrook Youth Soccer Board and has put on clinics for the youth of Northbrook community. Thanks for the memories, Knep!